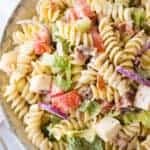 Bring on the Summer BBQ’s and serve BLT Pasta Salad! This yummy easy salad recipe is full of bacon, tomato, lettuce, pasta and more – one of my favourites! Cook the pasta according to directions until cooked al dente. Drain pasta and toss with enough ranch dressing to lightly coat the pasta, so it doesn't stick together. Refrigerate until cold. In a large bowl toss the cold pasta with tomatoes, Swiss, onions, bacon and lettuce.